Panaji, July 31, 2017: The All India Catholic Union (AICU) has denounced the hate speeches that emanated from the recent session of Sangh Parivar organisations in Goa. “Hate speeches have further vitiated the surcharged atmosphere, and aggravated the communal polarisation in the country. 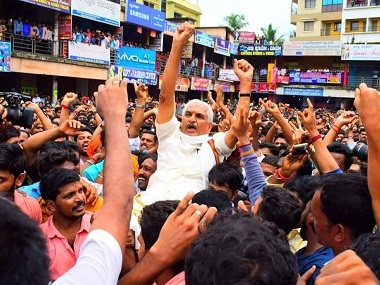 Sadhvi Sarasvati’s call for death to beef eaters is the type of targeting that has led to the rash of the large number of lynching of Muslims and Dalits in several states in India,” said Lancy D’Cunha, national president, AICU. Congratulating Ram Chandra Kovind, a Dalit, on his becoming the 14th President of India, the AICU has called upon him and Prime Minister Narendra Modi, to order exemplary action against such hate mongers. “Although government has sought to appease Christians in Goa and the north east by keeping the states out of the ban on beef, the politics of the cow has targeted Muslims and other communities whose food habits and economy depended on the trade in bovines. Its ramifications have not been fully understood, and AICU fears they will irretrievably damage the economic health of the farmers and the poor,” said D’Cunha. “AICU is also alarmed at the serial attempts by the Central and State governments to saffronise all levels of education in the country by direct changes in academic curricula, text books and teaching. The coming generations’ scientific reasoning and the pursuit of knowledge to a warped interpretation of history, archaeology and social sciences that will make children misfits in a modern world and will unravel the progress made in the decades since Independence,” added D’Cunha. In its review of the situation in Goa, the AICU expressed its solidarity with the demand of the Catholic Association of Goa for the setting up of a Minority Commission in the state. It noted that the Human Rights and other bodies meant to safeguardconstitutional rights were dysfunctional. “There was lack of transparency in government recruitment in the absence of a state services board or commission. This had created anarchy in the selection of candidates who were now being chosen at the whims and fancies of officers on interview boards,” said spokesman Dr John Dayal. “A major fear of the people is of moves to nationalize rivers of Goa to open them to the corporate sector as transport routes for coal. Any proposal to make a coal transport hub poses serious threat to the health of the rivers and its ecology which hasbarely recovered from the ravages by the ore shipping trade, “said Dr Dayal. The Union also backed the Catholic Community of Mumbai, the capital of neighboring Maharashtra, which has been fighting thedesecration of Crosses, and their arbitrary demolition despite authentic documentation of their antiquity. It noticed that the people had often voluntary shifted holy Crosses if they felt it was in the national cause. “It was in line with the Christian community giving up a church so that India’s rocket and space sciences could have their first base in Kerala,” added Dr Dayal. AICU noted that the mischief inherent in efforts by the Mumbai authorities in evolving development plans for the city without acknowledging the presence of churches and other Christians’ institutions. This makes them venerable to demolition in the future. The government must take remedial action immediately, said AICU.